Irish Drink Recipes: Hot or Cold a Delicious Irish Expression! Irish Drink Recipes: Hot Or Cold A Great Way to Express Your Irish Side! Let's lift our glasses to delicious Irish drink recipes! You don’t have to wait for a special occasion: some are perfect for the end of a busy day, a party for two or simply a quiet night at home. 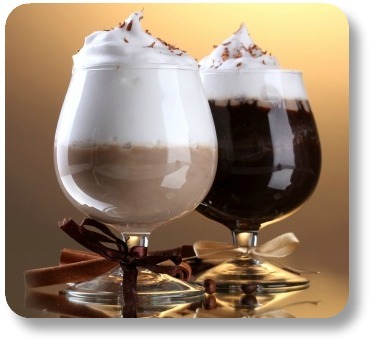 Many contain Irish cream, which is sumptuous as a dessert drink or the perfect topper for your coffee. Others contain an Irish favorite, Guinness Stout, a rich dark brew whose name makes you think immediately of Ireland. For the hot version of this classic concoction, visit our Irish Coffee article. For a delicious cold variation, read on! 1. Pour all ingredients into a blender. Blend until well mixed and frothy. Guinness cola, also known as the Trojan Horse, is a popular summer drink throughout most of the UK. It’s a great party drink, since the addition of the cola cuts the cost of the drink dramatically and doubles the distance for a bottle of stout. 2. Top with a half pint of cola in each mug and enjoy! If you go looking, you’ll find all types of recipes for a Guinness float. Some of them require tons of ingredients. To us, simple is usually best,. and it tastes just as delicious. Make sure you have very tall glasses when making the Guinness float. 1. Put the scoops of ice cream into a tall glass. 2. Add the Guinness a bit at a time, allowing the head to go down before adding more. 3. Enjoy your Guinness Float! A refreshing Irish cocktail with an iconic name. One of our favorites! 1. Put all the ingredients except the olive and twist into a shaker. 2. Shake and strain into a cocktail glass. 3. Add the twist and the olive. This is another good Guinness stretcher, which is great for a party. By blending only part of the recipe at a time, you won’t overfill the blender and have to clean the area after you pulse it. 1. Mix all ingredients in a large pitcher except the ice. 2. Add ½ C of ice to blender. 3. Pour ¼ mixture into blender and pulse. Carefully! When making Frozen Irish coffee or Irish cream coffee; you can create a beautiful presentation by putting chocolate curls (shavings) or sprinkling instant coffee on the top of the ice cream. You don’t have to add the sugar in the Irish Cream Coffee. If you like your coffee black, it makes it a bit too sweet. Adding more Irish Cream is also quite acceptable. When making the Irish Cream coffee, try Merrys instead of Baileys, particularly if you’re on a budget. I’ve found it’s an excellent substitute that some people like better, but costs quite a bit less than my favorite Bailey’s does. I use either one, but since Merrys is a bit thicker, I like it better in mixed drinks. The best time to serve Guinness Cola is on a hot day, as long as the beer and the cola are icy cold. Hungry for More Irish Recipes? Sharing Irish food is one of our favorite ways to enjoy an Irish experience, wherever in the world we happen to be! The flavors of an Irish meal, and the stories that come along with many Irish recipes, gives us a sense of connection with the Emerald Isle. At Irish Expressions, our our goal is simple: to provide you with a unique Irish experience, on demand, wherever you are in the world. If you have enjoyed our section on Irish Food Recipes, you have probably been exposed to many of the most delicious flavors that Ireland has to offer! Will that entice you to visit Ireland - or to return if you have already been? But even if that is not possible, you can still enjoy the magic of Ireland in these pages. Check out the links at the top of the page for simple instructions on how to explore Irish landmarks, enjoy Irish food, practice Irish customs, and much more! You can also visit us on Facebook, Twitter or Pinterest to see amazing pictures and interact with amazing people who share a love of Ireland. We would love to hear from you - please send us a note here and let us know how we are doing. Until then - thanks for visiting our favorite Irish drink recipes! Please continue exploring your Irish side at Irish-Expressions.com.